FiddleBop's story. Jazz with Gypsy zing! So here you are, at a FiddleBop gig, listening to FiddleBop's unmistakeable beggars-in-velvet jazz sound. "How did they get here? ", you ask. This version of the band began not long after Jo and Dave moved to Wales in late 2017, and is still developing. Sunday Jazz at The Nag's Head On The Thames, Abingdon. as well as many other live shows, of all kinds, and with the occasional guest musician. On stages large and small, on haywagons, in street markets, at festivals, in sunshine and (thankfully not often) in rain. In marquees and in gardens, at stately homes and universities, in pubs and in breweries and even in a distillery. 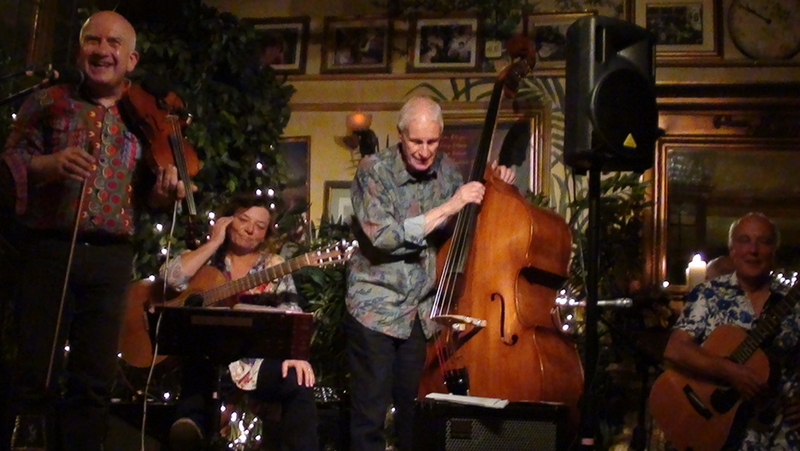 This first version of FiddleBop1 began when Jo and Dave began playing with guitarist, banjo player, and singer Martin Crowder and with double bass player Roger Davis. And the Jo-and-Dave duo began way back in the mists of time (a rainy day — geddit? — in summer 2004, actually). 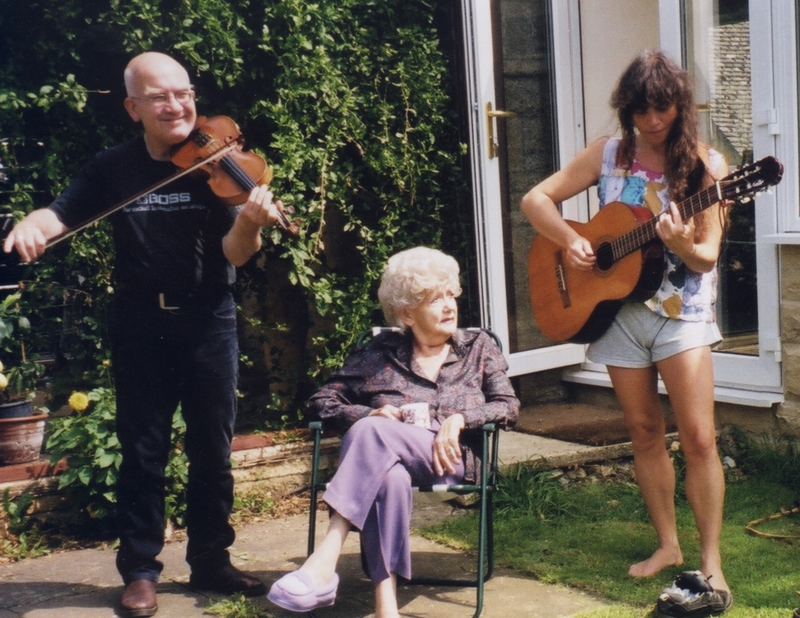 Dave Favis-Mortlock and Jo Davies were camping near beautiful Poppit Sands in West Wales when they tried playing some jazz tunes together, on violin and guitar. It sounded good, so when they returned to Oxfordshire, they kept playing. Before that? 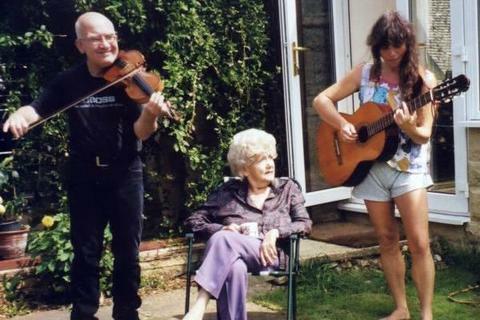 Dave had been playing the violin since his teens, and had fiddled in lots of bands: mostly folk-rock (including supporting Fairport Convention at their Cropredy Festival and elsewhere) but also some early music. Guitarist and singer Jo had been playing classical piano from a young age, and gigging as a singer-songwriter since her teens. 1Altho' there is an album called Fiddle Bop (by the Rhythm Rockers), also Fiddle Bop tunes by David Williams and Hardrock Gunter, and Fiddle-de-Bop by Lincoln Mayorga. And according to Merriam-Webster's Word Central, "to fiddlebop" can mean "to drop a musical instrument on the floor". Can that really be true?